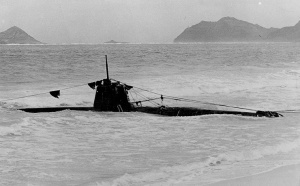 Midget class submarine no.19 grounded on Oahu beach. During the special attack on Pearl Harbor, five of these boats tried to enter into the Pearl Habor bay. Two actually made it into the harbor. The hull numbers of these midget submarines indicate that at least five I-class submarines, I-19, I-18, I-20, I-22 and I-16 were involved in the operation. A 1/700 scale model of the I-19 submarine and the US Navy Wasp carrier. No.19 was captured with its pilot Kazuo Sakamaki where it grounded on the east side of Oahu. A second Pearl Harbor midget submarine, No.18, was located by U.S. Navy divers off Keehi Lagoon east of the Pearl Harbor entrance on 13 June 1960. The third midget submarine was attacked by Ward (DD-139) at 6:37 a.m. on 7 December. This midget submarine No.20, was located in 400 meters of water five miles outside Pearl Harbor. This research was conducted by the University of Hawaii using a special research submersible on August 2002. More recently, another visit was performed by a Okeanos explorer ROV, on the 7th of December 2016, 75 years after it was sunk. The footage corresponding to that research is at the bottom of the page provided by Youtube channel of ABC news. A fourth submarine, No.22, entered the harbor and fired its torpedoes at Curtiss (AV-4) and Monaghan (DD-354). In this attack, both of those torpedoes did not hit the targets. Some sources indicate that the torpedoes might have hit a dock at Pearl City and the shore of Ford Island. Eventually, the submarine was sunk by Monaghan at 8:43 a.m. on 7 December. In 2009, a combined research team organised by PBS Nova successfully identified the remains of the fifth midget sub. She was found outside the Pearl Harbor entrance. Her name corresponded to the no.16, the fifth Ko-Hyoteki midget submarine that participated in the attack. It was discovered in salvage from the wreckage of the West Loch Disaster of 1944, dumped three miles south of Pearl Harbor. It is believed the fifth sub successfully entered Pearl, fired on Battleship Row, and escaped to the relative quiet of neighboring West Loch, where it was scuttled by the crew. Secret documents of the imperial Japanese Navy revealed that this was the orders they gave to the crew. First, fire againts targets and after that scuttle the submarine in a secure location. 1/700 Japanese Navy Mutsuki-class destroyer Kisaragi + midget submarine by Pit lord. Note the small size of the midget submarine compared to the destroyer.